Hello everyone!!! Hope all is well with you today!!!! I have a card for you today that was inspired by a card on Pinterest....here is the card that caught my eye. 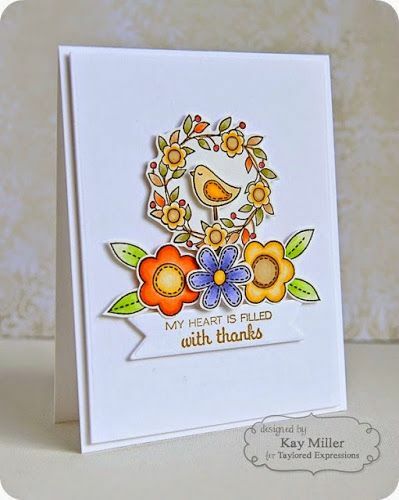 It's by Kay Miller from the Taylored Expressions Blog Team ...isn't this adorable!! I wanted to make a Thanksgiving card so I used this weeks Color Throwdown colors.....the wreath from the Taylored Expressions Falling For You set was colored with Copics and enamel dots were used for the centers. 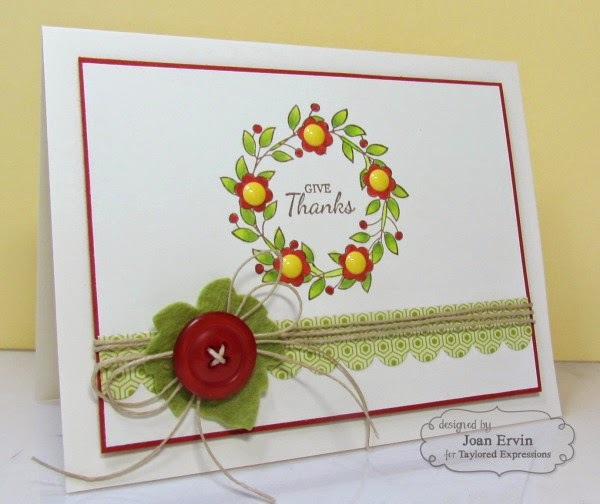 The sentiment is from the TE Many Minis - Holidays set and the scallop was cut with the TE Small Scallop Border die. The leaf die from the TE Sack It - Pumpkin die set was used to cut the leaf out of TE Split Pea 100% Wool Felt and the button and hemp cording finish it off. Thanks for stopping by... have a great day!!! Kay's is so pretty - and so is yours! Love the wreath you used. wow gorgeous card.. love that wreath..
Just gorgeous, perfect for Thanksgiving or any holiday really! Gorgeous card!! Love the design and Kay is wonderful! What a beautiful card. Love the felt leaf and the enamel dots accenting the wreath.